Marine turtle species and land turtles share reproductive behavior. Due to the female turtles' capacity to conserve sperm and carry fertilized eggs for long periods, little is known about the gestation period. Because female sea turtles can conserve sperm after mating for periods of several months, scientists can only estimate the gestation period. This is the period between fertilization of the ova and formation of protective albumen and shell before laying. Estimates of the gestation period range from seven to ten weeks to two years, as some scientists suggest the turtle may hold on to fertilized eggs for lengthy periods. The incubation period is easier to observe, and this typically lasts 60 days. 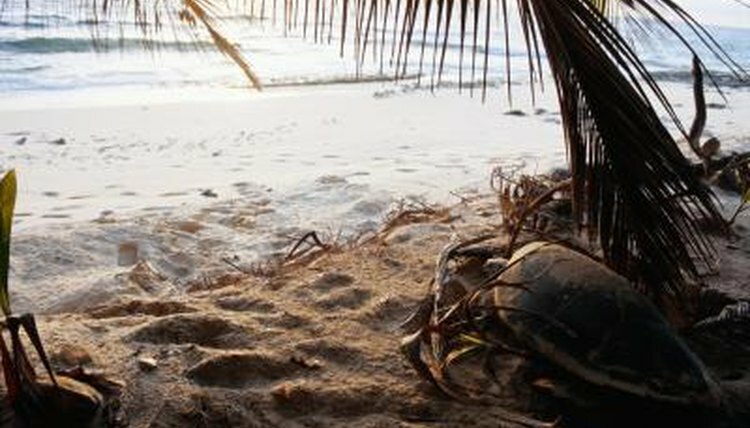 Higher temperatures in the sand where the turtles lays her eggs produce females, and lower temperatures produce males. The box turtle species, which are popular pets, share breeding characteristics with the sea turtles. A female may lay fertilized eggs for up to four years after one successful mating, according to the Smithsonian National Zoo.